The scheme entitles ratepayers in receipt of Universal Credit to a rebate on their rates and is being rolled out in conjunction with Universal Credit across Northern Ireland. To apply for Rate Rebate the tenant or homeowner must be of working age, in receipt of Universal Credit and live in the property. 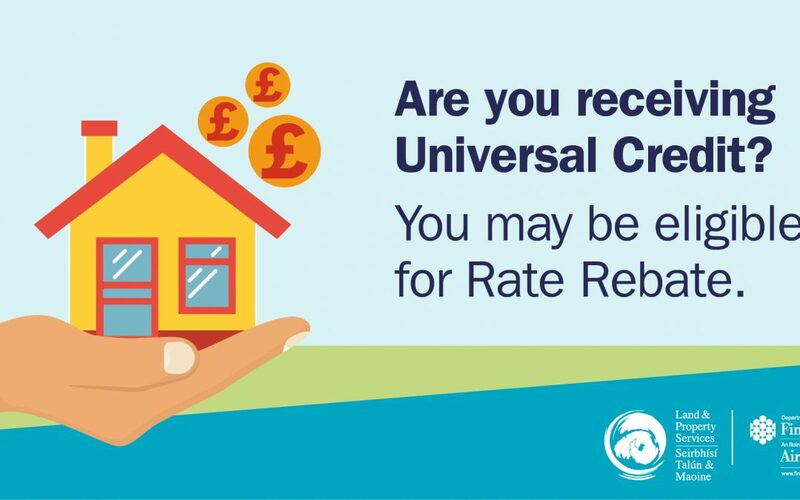 Tenants or homeowners can only make a claim for Rate Rebate once awarded Universal Credit and any claim should be made as soon as possible following their first payment of Universal Credit. Claims should be made within three months to ensure no partial loss of any subsequent award. Visit www.nidirect.gov.uk/homeowners-and-tenants-applying-for-rate-rebate for eligibility information on the new Rate Rebate for homeowners, tenants in social housing and private rented housing. Rate Rebate is a very straightforward online application through nidirect. Claimants register for an online account using their own email address and following registration make their online application. If Universal Credit has not been yet rolled out in a particular area or a person is not eligible for Universal Credit, such as pensioners, rates support will continue through Housing Benefit. Claimants can obtain further details and apply directly online at: www.nidirect.gov.uk/rate-rebate-scheme or call Land & Property Services on 0300 200 7802. The Department of Finance Rate Rebate Scheme replaces the rates element of Housing Benefit for working age tenants and homeowners and is administered by Land & Property Services.